SOLD! 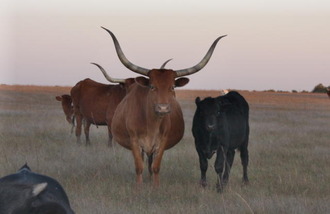 Thank you to Loyd Gibbs, Three G Ranch, Lakeview TX! This is an AI daughter of the Ron Jones bred bull, JR Seman, who Ron sold to Larry Lonero at the Winfield Sale for $13,000. JR Seman was 66" tip to tip and 91" total a few years ago. Her dam, Over Rated was a flashy red and white AI daughter of Overwhelmer. that we sold to Tracy Sekely, North Jackson, OH.